Winchcombe Pottery is celebrating its 90th anniversary this year, many of those years as members of the Gloucestershire Guild of Craftsmen. 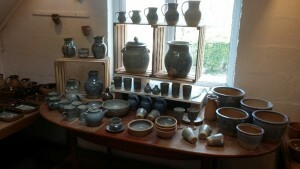 The exhibition in The Guild at 5, shows representative examples of the pottery’s current output, production ware for everyday use. The original pottery, known as Becketts or Greet Pottery started up around 1800 as a country pottery using the earthenware clay dug on site. It closed in 1914 and was re-opened in 1926 by Michael Cardew who ran it until 1939 when Ray Finch took it over. It has been in the Finch family ever since. 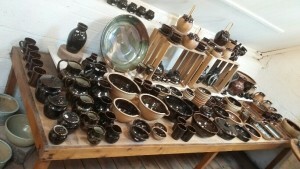 Ray’s son Mike took over the management of the pottery in 1979. Winchcombe Pottery has not only been one of the longest running but also one of the most important studio potteries in Britain in the 20th and into the 21st centuries. Its wood fired, stoneware pots have set the standard for domestic studio pottery that continues to influence potters today. Over the years many other potters have trained at Winchcombe , some, such as Toff Milway and Jim Malone are now amongst Britain’s leading potters. Mike continues to run the pottery today with the help of Manager Matt Grimmitt, a relative of Elijah Comfort who was the chief thrower for Becketts and also helped Michael Cardew get the pottery going in the early days. Two other potters, John Forster and Daisy Martell make up todays small team, with other students and helpers that come and go.